Black Diamond's Couloir is not the harness I'd want to be wearing if I was going to be hanging around all day, but short of that need, you'll have a hard time finding a better choice for ski mountaineering. That shouldn't be too surprising: ski mountaineering is exactly what Black Diamond had in mind when they built the Couloir. In terms of design, the Couloir looks a lot like the venerable old Alpine Bod harness, but in a lighter (8.3 ounces, men's small, measured), much more supple and compact package that has been updated with a few notable touches. Unlike the Alpine Bod, for example, the Couloir Harness has a belay loop to make life a little easier (by keeping belay/rappel devices positioned/aligned correctly), and it has four ice clipper slots for hanging ice screws. Another significant difference is the Couloir's compressibility, courtesy of the softer webbing that it employs. 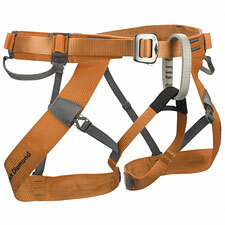 As Black Diamond notes, you can easily stuff the Couloir Harness into a jacket pocket when you're not using it. When you are wearing the Couloir, the softer, smoother, thinner webbing is unobtrusive against your body—staying out of the way of clothing, gear, and skiing fun. At the same time, the Couloir remains a robust and durable harness that won't suffer terminal damage the first time you scrape it against a sharp rock. Skiers and crampon-wearing climbers will like the quick-release leg loops, which allow you to put the harness on and take it off without removing your skis or boots. The waist belt closes with a traditional back-and-thru design. Probably if you want a lighter harness than this for skiing, you're just going to improvise your own via a runner and a carabiner. CAMP USA'a swanky Air CR would be another option in this category and weight class—more comfortable for hanging, but definitely bulkier and more noticeable around your waist.